For the 18 Spring Season, TOTEM COLLECTIVE introduces “BACKPACK 01” and “TING 01”, two new additions to the leather bag collection, as well as the brand’s playful and flamboyant side with the new “Extra Galactic” patch collection, including “Le Discoball”, “Violet Stardust”, “Pink Vanille” and “Mirror”. The EXTRAGLACTIC collection draws inspiration from elements of Friday night dancefloors and the David Bowie glamour. Patches including pink glitter, violetstardust, disco ball fragments and mirror reflective panels gather into a statement to challenge the existing collections, yet also an invitation to a peaceful co-existence. Clashed between the everyday dullness and the moments of surreality, the campaign imageries are combinations of the known and the unknown. The similar scenes ring bells of familiarity, while the objects and specific scenarios almost come from dreamlands far far away. Photographer Chris Calmer plays with the elements of the everyday to the outer space to portray the versatility and playfulness of TOTEM COLLECTIVE. 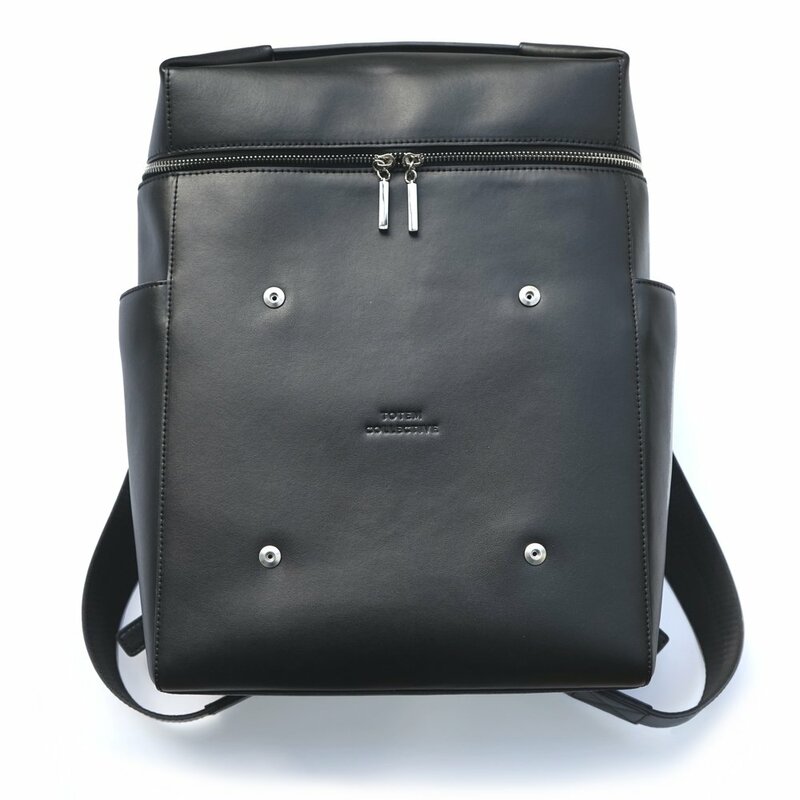 The BACKPACK 01, designed in collaboration with WIBOE PROJECTS, continues the signature four buttons on the front facade of the bag with the logo subtly embossed in the center, follows the design philosophies of the TOTE 01. The BACKPACK 01 pens up with a rounded zipper line surrounding the top level, it also has a computer compartment, adjustable straps and a top leather handle for hand carrying. The TING 01, also being a unisex product, is the mini carrier of the TOTEM Patches. The 19 x 19cm BOX 01 s exactly the size of a signature TOTEM COLLECTIVE patch, and it comes with two different length straps, allowing an easy hand-carry and a cross-body carry.